Helping business end users make the best decisions in response to fast-changing market conditions requires instant and accurate business information. The best way to make IT more responsive to business needs is to provide the tools and strategies to automate many of the processes that deliver BI services from the data center. Automating IT processes for BI processes delivers more accurate and relevant data, eliminates serious resource inefficiencies and actually reduces IT capital and operating expense through elimination of duplicate and manual data management efforts and the associated expense of managing redundant solutions that proliferate throughout an enterprise. That business intelligence (BI) is at a critical crossroads and attentive Chief Information Officers (CIOs) who increase BI responsiveness are at the forefront of defining a new strategic relationship between IT and their business end users. Strategies and technologies are available to help IT leaders make BI more accessible and meet the growing need for these services. 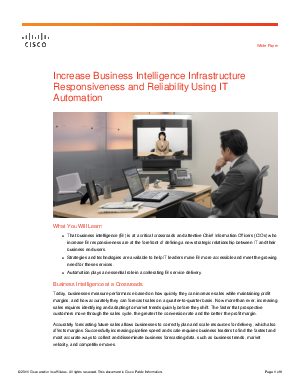 Automation plays an essential role in accelerating BI service delivery.